I have a huge apology to offer. I am soooo sorry to leave the post of Chocolate Cake up for so long. I had one of my friends tell me the other day that that picture was killing her. She had gone to my blog to find the Marinara recipe and all her kids could say was, "Please make that Chocolate Cake!" I'm afraid to admit I was out of town for a week and didn't look, but now that I'm back, it's haunting me. The recipe today probably isn't much better, but at least it's not Chocolate Cake:) Sorry friends! Gingerbread Waffles are my favorite thing on the planet! I've seen lots of pumpkin waffles, and pancakes, but not Gingy Waffles. My mom started making these for us years ago, and it was always such a treat. I've blogged about them before, but tis the season to start thinking about them again. Actually I love them in Feb. and June, and just about any month. They're perfect for Christmas morning, or the day after Thanksgiving brunch, or just any Saturday of the year. My grandma B. used to make Gingerbread cake for my mom and she'd serve it with whipped cream with mashed bananas folded in. This recipe is along those same lines, but I up the ante with Buttermilk syrup as well. These really are good leftover as well. They don't need anything on them later in the day or during church. They're delicious on their own. So as the weather gets a little chilly, and you're craving something festive give these a try. Sat. is only a few days away. 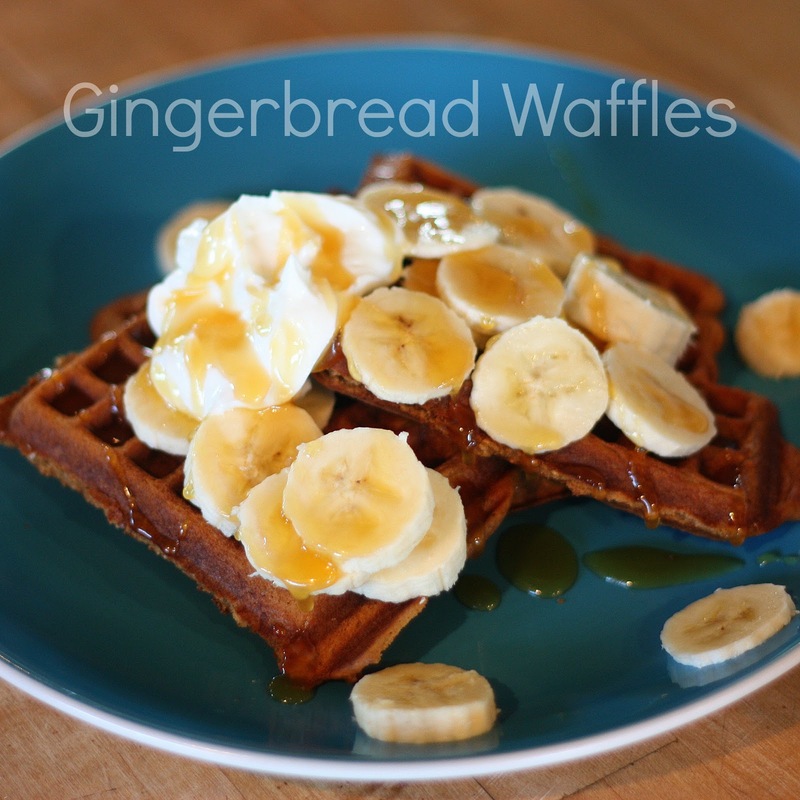 Mix all together with a hand mixer and place on a hot greased waffle iron. Serve with Buttermilk Syrup (here's a link to that recipe), sliced bananas, and whipped cream. You may need to double the batch. You'll want leftovers. Place in a big pot. This stuff foams out of control at first. Bring to a boil and then let boil until it turns a nice dark golden brown. About 8-10 mins. I usually 3 times the batch and it will make about a quart. I don't 3x's the butter though. Maybe only 1 1/2 cubes of butter to a 3 batch.